The brethren gathered for the installation of Paul Spann as the WM of Brookfield Lodge No 5077 for the second time in a row. On this occasion the installation was by proclamation. Stewart Seddon (left) congratulates Paul Spann (right). In attendance was Assistant Provincial Grand Master Stewart Seddon along with group treasurer Mike Silver and acting Provincial grand officers Mark Howard and John Pitches. The brethren were treated to the playing of delightful music by Ray Dainton. What followed was a delightful ceremony with everyone putting in a lot of effort. At the end of the ceremony Stewart Seddon brought greetings from the Provincial Grand Master Tony Harrison and congratulated Paul for retaining the chair of King Solomon for a second successive year. He made special mention of the two junior members, Russell Jereis, an entered apprentice of only 6 months and Graeme McLeish a fellow craft and who had delivered the first and second degree tools respectively. All three working tools were presented in a thoughtful manner. A grand total of £2,400 was given to 11 charities, a great amount from a small lodge. £500 was donated to Westhoughton Banqueting, £200 each to Children Today, Derian House, Bolton Hospice, Air Ambulance, Ecclesholme, Henshaw, Fort Alice, Firwood School and West Lancashire Freemasons’ Charity, and £100 to Tuesday Club. 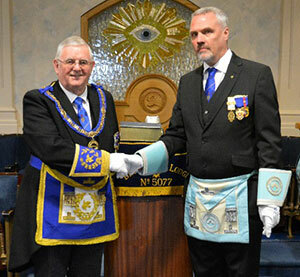 Stewart thanked the brethren of the lodge for the wonderful donations. Paul Spann (centre) with Stewart Seddon and other grand and acting Provincial officers.